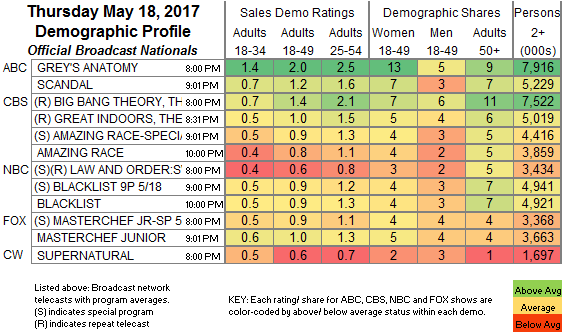 NETWORK FINALS: The GREY’S ANATOMY season finale and the 10PM AMAZING RACE gained 0.1 in final numbers. CABLE HIGHLIGHTS: With no NBA game on Thursday night, NBC Sports Net was able to get a win with its NHL PLAYOFFS game at 0.49. History aired back-to-back SWAMP PEOPLE specials at 0.48/0.48, both 0.09 above last week’s single episode. Univision’s LIGA soccer matches were at 0.44/0.30. (Nick At Nite, like HBO and other cable networks, lists its theatrical movies as “originals,” which is why SHREK FOREVER AFTER is on the chart at 0.41.) The bluer news shows once again benefited from the headlines, as the Top 11 featured MSNBC’s RACHEL MADDOW SHOW at 0.39/2.9M, Comedy Central’s THE DAILY SHOW at 0.33 (with lead-out THE PRESIDENT SHOW up 0.03 to 0.19), and the 9PM hour of CNN’s ANDERSON COOPER 360 at 0.32/1.5M, all of them well ahead in the demo of Fox News’s TUCKER CARLSON TONIGHT at 0.24/2.7M. On Lifetime, MARRIED AT FIRST SIGHT rose 0.02 to 0.33, and SECOND CHANCES ticked down to 0.15. Spike’s LIP SYNC BATTLE climbed 0.02 to 0.33. On ID, EVIL STEPMOTHERS grew by 0.07 to 0.33, and FEAR THY NEIGHBOR was up 0.04 to 0.31. Food Nework’s BEAT BOBBY FLAY rose 0.03 to 0.30. On HGTV, FLIP OR FLOP ticked up to 0.30, HOUSE HUNTERS was also up 0.01 to 0.29, and HOUSE HUNTERS INTL ticked down to 0.27. We’s BRAXTON FAMILY VALUES dropped 0.04 to 0.29. 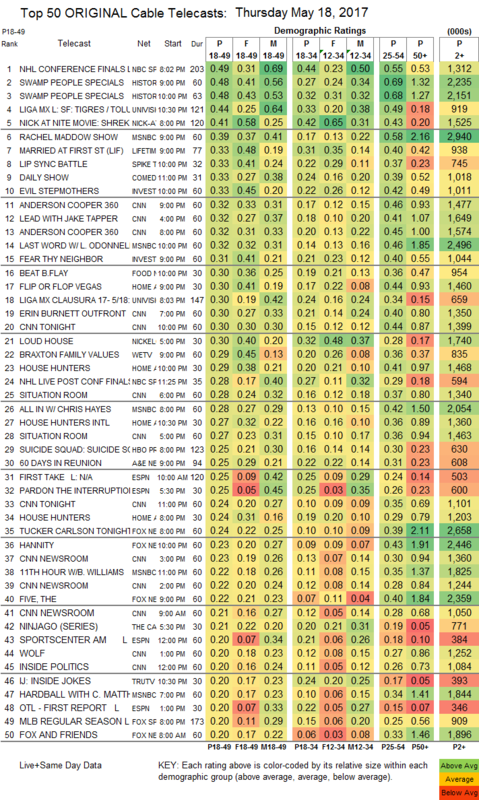 An A&E 60 DAYS IN reunion special was at 0.25, down 0.12 from last week’s episode. E!’s SECOND WIVES CLUB lost 0.03 to 0.12. POP’s IMPACT WRESTLING dropped a tick to 0.06.